An extra virgin olive oil produced in the Manacor area has been named one of the best in the world. 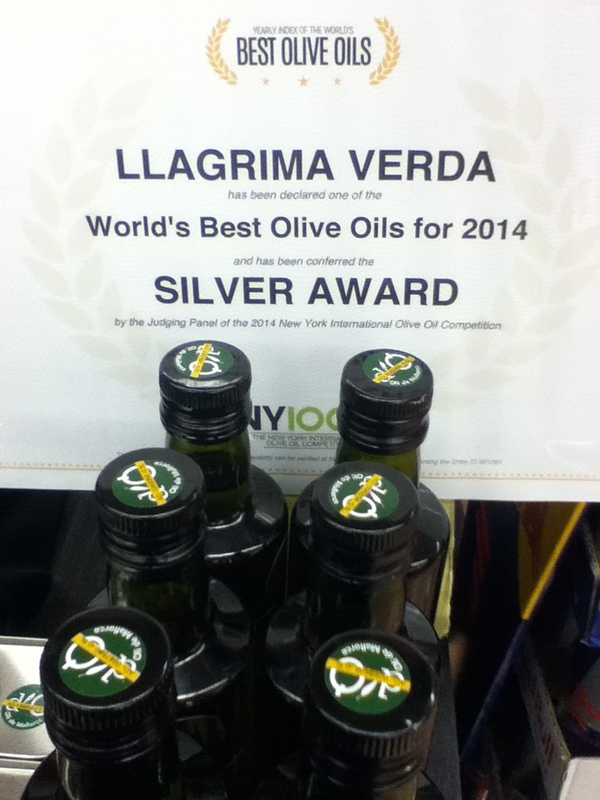 Llàgrima Verda (which means ‘green tear’) won a Silver Award in the New York International Olive Oil Competition 2014 – repeating the success they enjoyed in last year’s competition. The annual competition brings together a panel of international experts who taste nearly 700 extra virgin olive oils from around the world, to determine the very best. This year Spain won more prizes than any other country in the world. Llàgrima Verda is produced by Els Olis Ínsula, from olives grown on some 2,000 olive trees on the Finca de Son Pere Andreu, on the outskirts of Manacor. The Aguiló Veny family decided to dedicate themselves to olive oil production and, as well as the prize-winning Llàgrima Verda, they produce two under the Ínsula name. One of these is made entirely from Koroneiki olives (a Greek variety they successfully planted on Mallorca) and the other a blend of Koroneiki and Arbequina. Llàgrima Verda certainly gets my seal of approval (not that I have the influential powers of the prestigious New York International Olive Oil Competition). Delicious with Flor de Sal from Mallorca and some good crusty bread. Who needs anything more? If you’re in the Balearics this summer, be sure to try some Llàgrima Verda. It’s on sale in Hiper Centro supermarkets across the islands.